Just days after performing a spectacularly delicate landing watched by millions of people worldwide, NASA's rover Curiosity has returned the first full-resolution images of the Martian surface from the navigation cameras on the rover's mast. The mast, Curiosity's head, was deployed after landing, and the dual navigation cameras have medium-angle, 45-degree fields of views and are capable of returning three-dimensional information about the Martian terrain. They are designed to survey the landscape broadly and quickly and are capable of looking all around and also up and down. The view seen here, near the pebbly rim of Gale Crater, is very mountainous due to erosion, with the middle ground composed of low-relief scarps and plains. The foreground shows two distinct zones of excavation likely carved out by blasts from the rover's descent stage thrusters. See the full-resolution 1,024 by 1,024 pixels image here. As Curiosity awakened on Mars after its long journey, this is the first image taken by the navigation cameras, showing the rover's now-upright mast in the center, and the arm's shadow at left. The arm itself can be seen in the foreground. The navigation camera on the mast is used to help find the sun -- information that is needed for locating and communicating with Earth. After the camera pointed at the sun, it the turned in the opposite direction to view its shadow, helping to confirm the sun's location, and thus the positioning of the rover itself. NASA's Curiosity rover captured this 360-degree self portrait with the navigation camera pointing down at the rover deck, up and straight ahead. Except for two full resolution images, most of the tiles are thumbnails, as engineers wait for the full resolution images to be sent back from Mars. NASA's Curiosity rover captured this 360-degree panoramic view from the landing site with the navigation camera. Mount Sharp is to the right and the north Gale Crater rim can be seen at center. 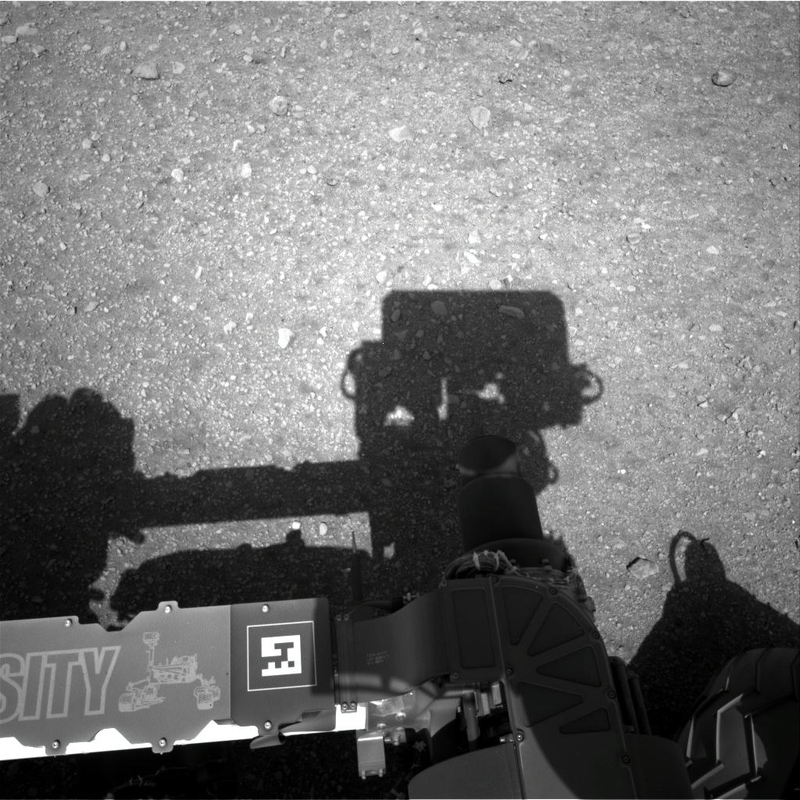 The rover's body is in the foreground with the shadow of its mast poking up to the right. 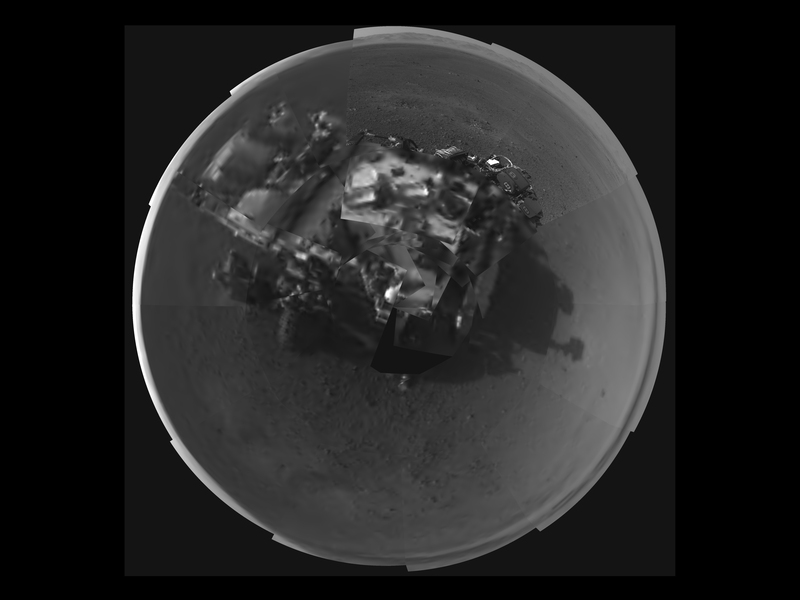 The images were acquired at 3:30 p.m. on Mars, or the night of August 7 PT. See the full-resolution 1024 by 1024 pixels image here. As Curiosity landed, we can see here where the soil was blown away by the landing thrusters during the descent stage, exposing the bedrock beneath the thin layer of surface dust on Mars. 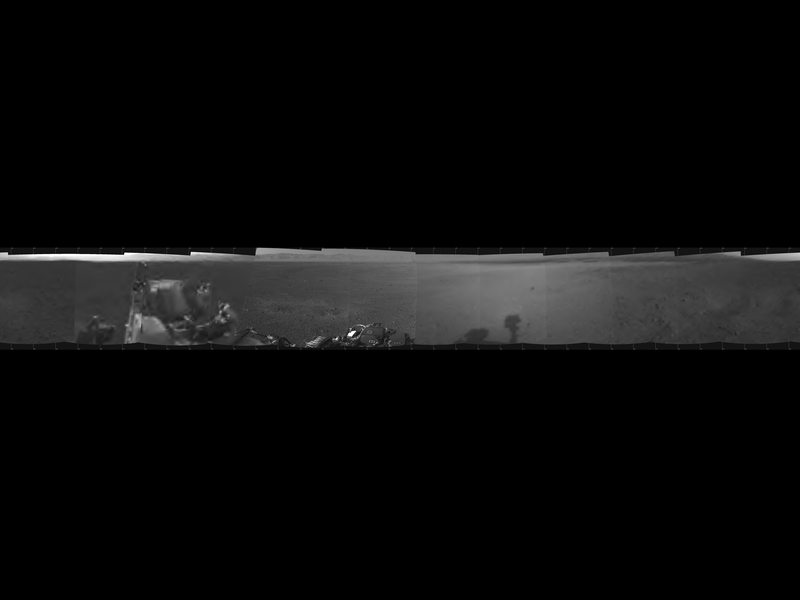 Now we bring you some raw images taken by Curiosity's Navcams during its second Martian day (sol) on the surface. This photo, from Navcam Left A, shows two of the rover's six wheels. This photo, also from Navcam Left A, shows part of the top of Curiosity's chassis. Another view of the top of Curiosity's chassis from Navcam Left A. 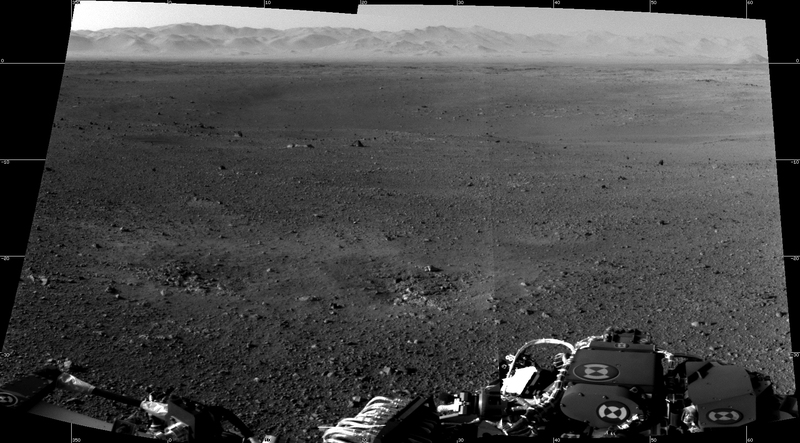 This view from Navcam Right A shows a corner of the rover in the foreground, and off in the distance, some hilly terrain. Curiosity name-checks itself in this photo from Navcam Right A.